of rubber which he claimed couldn’t be torn. In fact, he was so confident that he offered a five pound note if anyone could do so. Unfortunately for Mr Hawker, he hadn’t counted on the super-human strength of Dominic Baggott in Year 7, who promptly relieved our guest of a crisp blue/green note from his wallet. To be fair to Mr Hawker, the rubber did have a small tear in it already, which Dom took clean advantage of! It was also rather interesting to find out that during WWII, German planes flew with Dunlop tyres. This scared the life out of a Spitfire pilot when he went with his CO to find the wreck of a plane he’d claimed to have shot down. On finding the tail wheel marked with Dunlop, his first thought had been that he’s accidentally shot down another Spitfire. As it turned out, Dunlop had a sister company in Germany which, during the war was obviously requisitioned by the Nazi regime to help with their efforts. 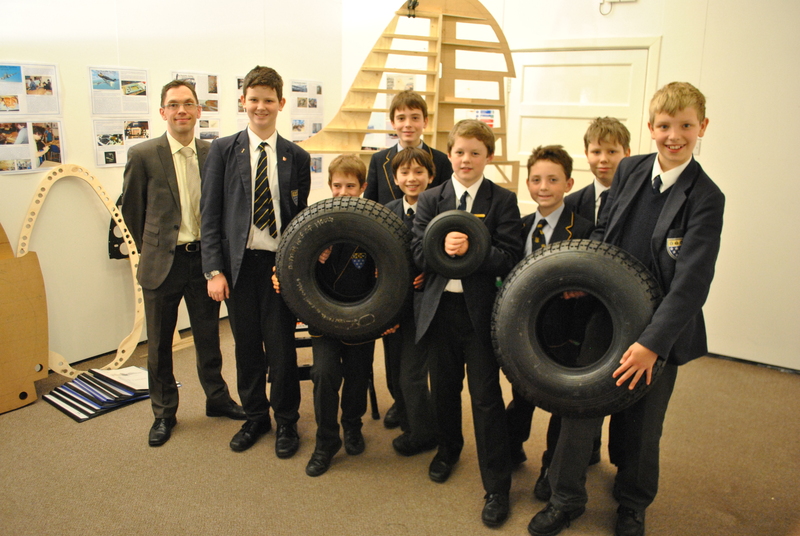 There were a good number of students and some staff who attended, and some very pertinent questions were asked; Charles Grattan in Year 11 was interested in market share percentages, and Kit Jackson in Year 7 seemed keen to know more about how Dunlop test their tyres by exploding them with extreme pressures of water! The event was rounded off with a number of photographs being taken, and the boys who also help with the Spitfire project showed their appreciation to Mr Hawker for the very generous donation.